Philips Satinelle Advanced Epilator BRE640/11 is a 100% waterproof, easy-to-handle epilator for lasting, effortless results that fits legs, body and face. 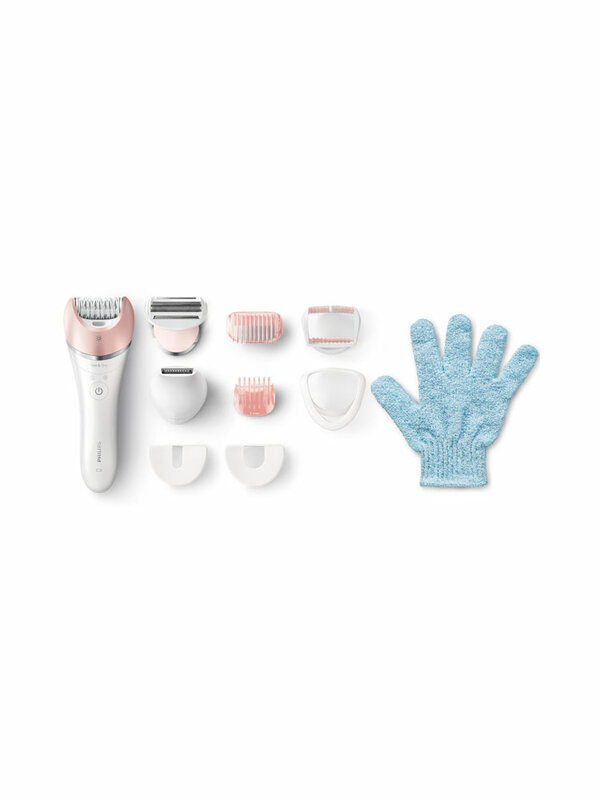 Soft and pleasant under the shower or in the bath, with a non-slip grip for a perfect use on a dry or damp skin, this epilator allows precise and natural movements throughout the body. The rough texture of the ceramic used on the depilation head makes it possible to firmly grasp even the finest hairs. The ultra-wide head allows optimal hair removal in one pass and lasting results. The light on the device allows the detection of fine hair, for optimal depilation on all areas of the body. The heads dedicated to the care of the body bring you personalized and practical solutions, for a new routine combining hair removal and body care. The shaving head and the cutting shoe produce a close shave and a smooth cut on the different parts of the body. A shaving head and a stylish jersey of the jersey practices are provided for trimming and stylizing delicate areas. A facial accessory and a delicate accessory for underarms are provided, for more gentle on different parts of the body. The massage accessory makes hair removal more enjoyable. The Skin Stretcher accessory tightens the skin during depilation. The exfoliating glove allows to avoid the appearance of the ingrown hair between two depilation. Read carefully the instructions of use. Wireless use, autonomy of 40 minutes. Indication: Epilator for legs, face and body.